We met more SOBO riders on today’s section. Jazz & his uncle were riding from Banff to mi-Wyoming. Jazz was the youngest rider we’d seen on-route. 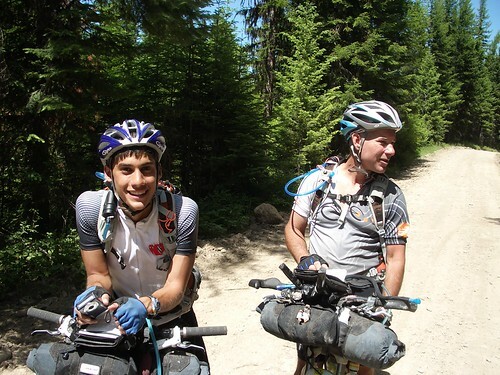 His uncle is planning to ride the 2011 Tour Divide. Later, we met a pair on a mountain bike tandem. I didn’t even know tandems were made with suspension. We found a shady spot for lunch on the side of a dirt road. The sun was intensely hot that any body part exposed to it instantly felt burning. We ate quickly because the our shady spot was slowly shrinking to nothing. 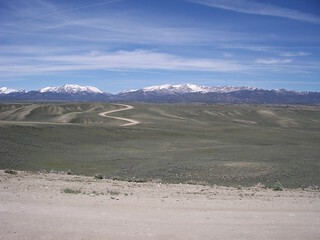 Down the road, we reached another difficult section to navigate. Again, the cues could be read more than one way. We took a wrong turn and climbed a few hundred unnecessary feet. As we neared Swan Lake, I caught up to Mathieu who was stopped in the middle of the road. He was watching two black bears 50 yards ahead. My approach scared them off, though. At Swan Lake, we rented a cheap bunk house to spend the night. The price included a well-deserved shower. I stayed up late in the mosquito-proof cabin updating my journal by headlamp. This entry was posted in Journal on June 3, 2011 by dave.